Time for me to update my entry ladder, the one I made last spring and have changed with each season. With February's arrival, I updated it for Valentine's Day. 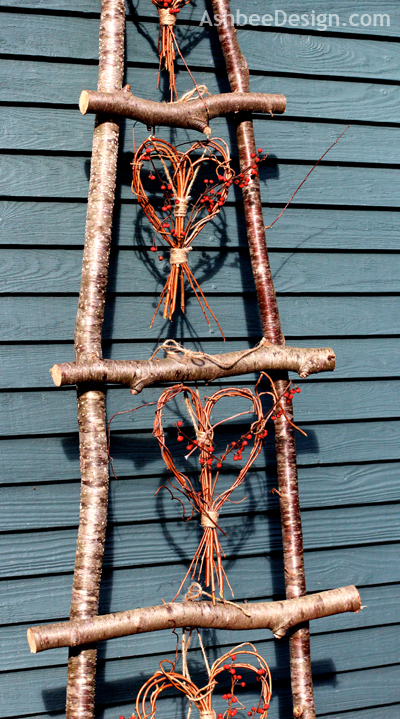 This ladder is made from branches and reflects my tendency to incorporate nature into many of my designs. I started with using red plastic solo cups to try and design something creative and weatherproof but that lasted all of 10 minutes of effort. Just not my style. 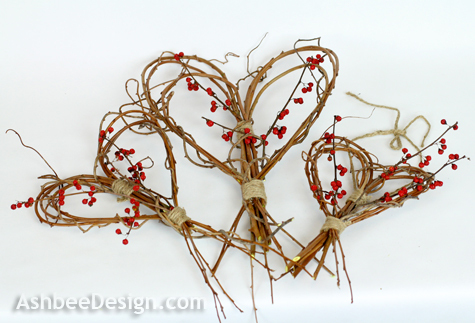 Instead I made rustic hearts from green sticks, twine, bittersweet vines and berries. I made five hearts in a range of sizes. The thickness of the twigs determined the smallest I could craft - which was about 9". 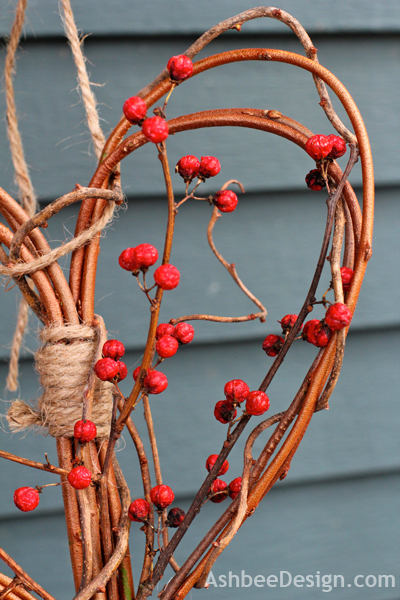 I added more twine and, after taking out the Christmas arrangements, I hung these rustic hearts from the rungs of my handmade ladder. 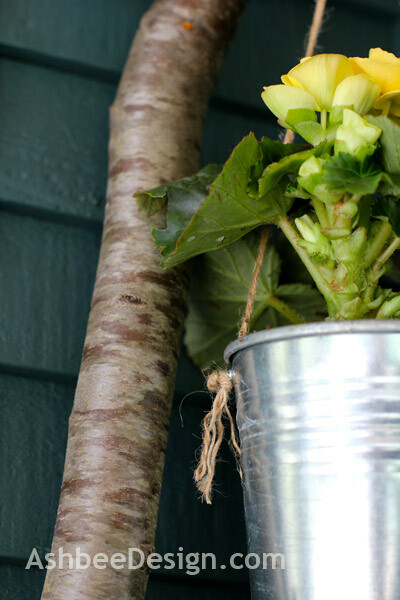 This is probably the 8th different seasonal arrangement I've made in this ladder, and it is the first time I thought of moving the ladder off my north-facing porch and into the sunshine to get more vibrant pictures! 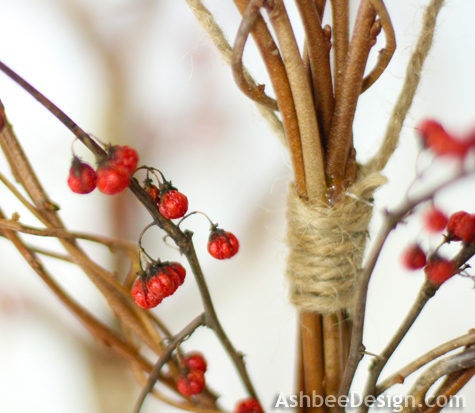 I love the red berries (which I pilfered from the Christmas arrangement!) against our siding color. 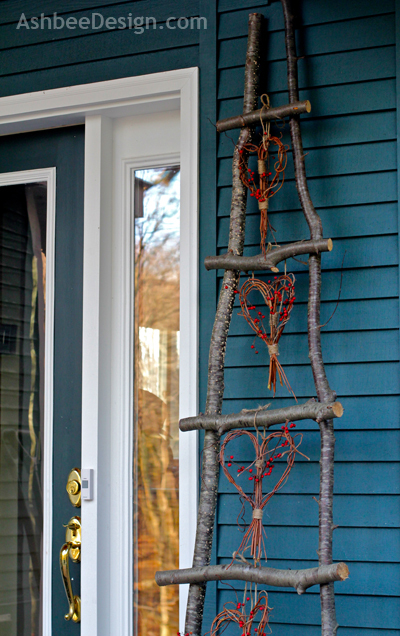 The twig hearts are a perfect addition to the black birch ladder, which is starting to sprout little white fungi! Update: Tutorial for the hearts is up here. Additional update: See the hearts dressed in snowflakes after the blizzard here. Incredibly beautiful. I think the technique you used with the twine is called whipping. It is not really a knot but a way to secure the end of a rope to keep it from unraveling. I am an old Girl Scout and currently work with a Boy Scout troop. 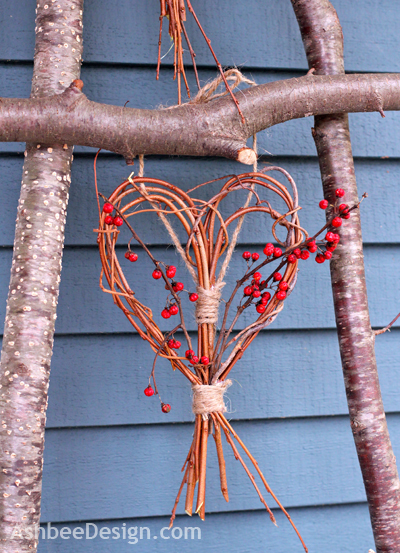 Funny, when I first saw your photo of the twine heart, I thought that whipping would be a good way to attach the twigs. Similar vision, I guess. So right! I just did a goggle search and found a demonstration. I'll go an update the bog. Thanks Lynne! Just posted there - been looking for another active Friday link party! Thanks for visiting. Love this and the simplicity of it. 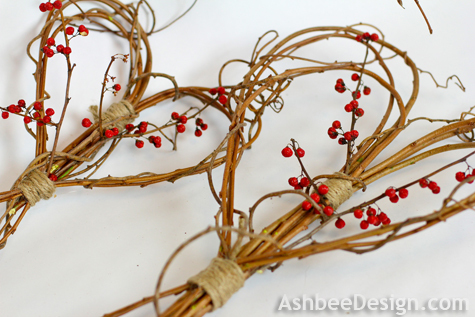 I collected a bunch of rose hips in December which are still good and would work great for this. 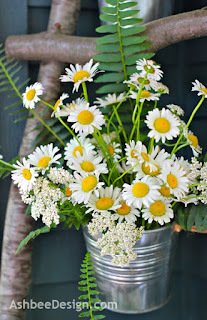 I'd love for you to link up over at Finding the Pretty & Delicious Linky Party. Thanks for visiting and commenting Leigh Anne. I just posted on your link party and am now drooling - lots of delicious looking food over there! The twig hearts are adorable!! 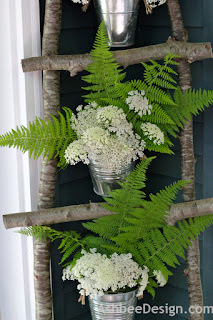 Love the natural look and all the ways you have decorated the ladder. Thanks Marlee, appreciate your visiting and taking the time to comment! Absolutely adorable!! I just love this. So so cute. I love your ladder and your hearts. It looks like the ladder looks great through every season the way you have it decorated. Great photos, too. Thanks for sharing. I just might have to make so for myself. Have a great day. Be sure to send pictures if you make one Lori. Thanks for commenting. Have gone to FB to follow you. thanks for visiting and commenting. I love ladders in decor. Yes, you can use them anywhere. I did a whole series of posts on using ladders. Check it out under my themes menu above. That ladder is just awesome! I'll be back for your tutorial, and I'll have to raid my MIL's grapevine bush - I do know where to find some bittersweet but it's in a complete stranger's yard! Wish I had harvested more last fall. Maybe you should make a friend of that stranger :-). The tutorial is up and there is a link above. Your twig hearts are fantastic, love it! 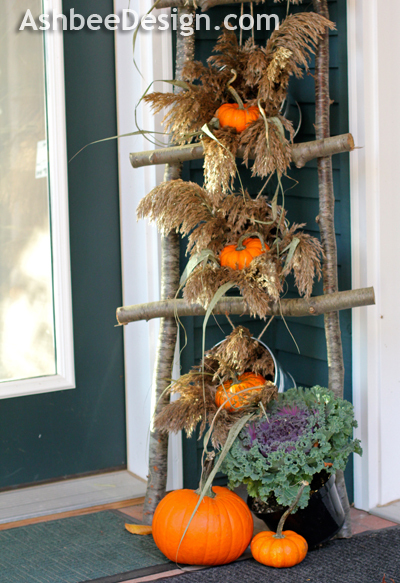 Also your ladder decor! 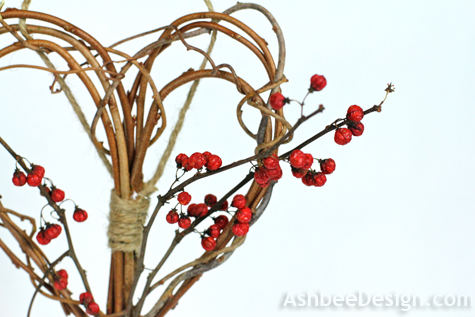 I also did a twig heart, stop by and see! Just went for a little stroll over to your site to check out your heart- very different approach and looks great. Did you hand it on your door? I should have saved more last fall when they were all over the roadside. I just have the few left. Thanks for visiting and commenting. Those hearts are awesome! I love anything natural looking. The ladder has been a treasure all year. Its anniversary is this spring. I'll have to think of a new twist for 2013-14! 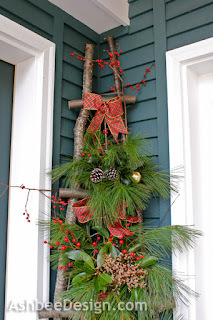 Love the ladder and the fact that it changes with the seasons and holidays. 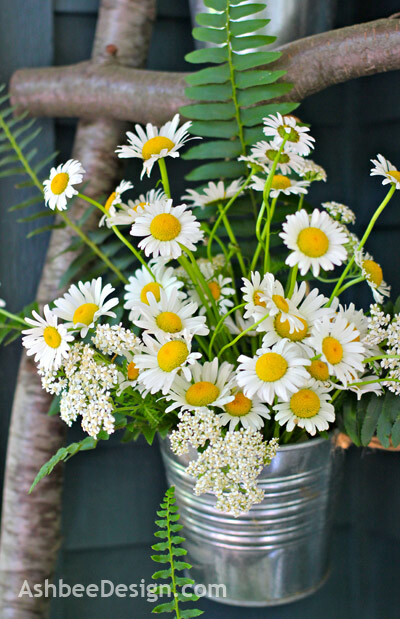 Great use and reuse project! The forest offers so much for free. I have found it to be an incredible inspiration. So pretty...I love seeing all of you holiday variations on your ladder. Happy Valentine's Day! March has me stumped! Thanks for visiting and commenting! 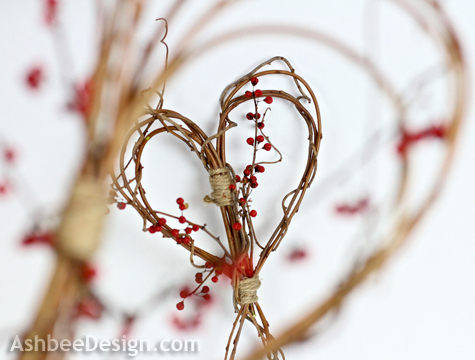 Wow - I adore this twig hearts!!! Thanks for linking up at Romance on a dime!! I love those hearts - so simple and organic. 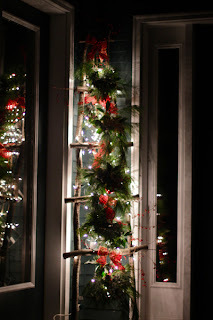 And I love them hung from the rustic ladder. I'm going to have to look out for some willow twigs at the cottage when I'm there in the spring. I'm coming over from the DIY Showoff link party. 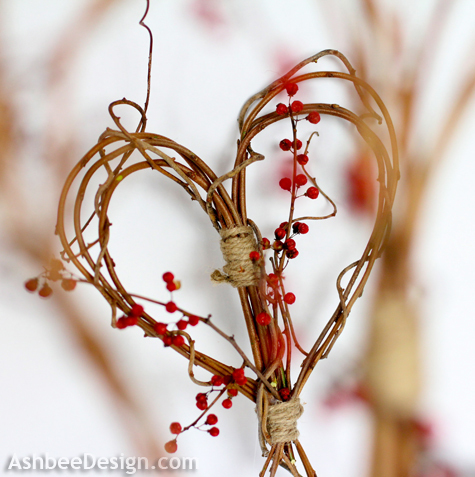 This twig heart is great. I also really like your wood ladder and the changes you do each season. Very nice!